Owing to a modernized infrastructure for trouble-free processing & post-production, we are instrumental in offering Ridge Ventilators. Our offered ventilator is highly demanded in the market due to its excellent finish & better ventilation. This ventilator is designed using the quality assured material as per the set industry norms. Customers can avail this ventilator from us at competitive rates. With an increased proportion of technology, we are offering a qualitative assortment of Turbo Ventilators. Offered turbo ventilator is checked in terms of quality in order to supply a flawless range. This turbo ventilator provides a safe, cool, healthier and more controlled environment. Furthermore, we are offering this turbo ventilator in different stipulations as per the needs of customers. Air Ventilators offered by us are precisely designed and engineered that enables them to exhaust Industrial pollutants such as smoke, dust, poisonous gases, humidity, fumes, heat and many more invisible irritants from the covered area. Our top quality range provides safe, healthier and more controlled environment by removing the entrapped heat and industrial emission and provide energy free cooling and fresh air through out the year. Wind turbo ventilators do not require operating time as they continuously rotate with the wind. 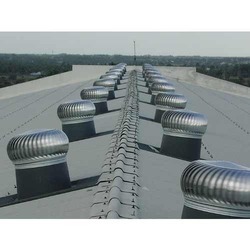 These products are Wind operated Ventilator that can be installed on any type of roofing and are rotated by the wind. As these systems function and perform with the unlimited energy source like wind energy thus save running cost exhaust fans, wiring and also requires less maintenance. Above all, our range is economical, ecological and weather & storm proof. 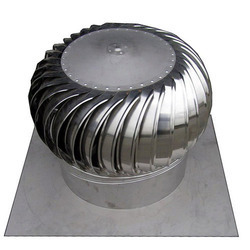 With an aim to fulfill varied requirements of our valued clients, we are engaged in offering Aluminium Turbine Air Ventilators. With phenomenal market understanding, we are able to introduce an extensive range of Aluminium Turbo Ventilator. Powerless Ventilators offered by us are precisely designed and engineered that enables them to exhaust Industrial pollutants such as smoke, dust, poisonous gases, humidity, fumes, heat and many more invisible irritants from the covered area. Our top quality range provides safe, healthier and more controlled environment by removing the entrapped heat and industrial emission and provide energy free cooling and fresh air through out the year. Wind turbo ventilators do not require operating time as they continuously rotate with the wind. 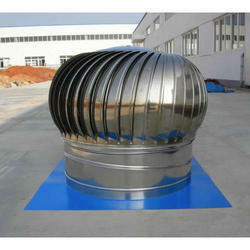 These products are Wind operated Ventilator that can be installed on any type of roofing and are rotated by the wind. As these systems function and perform with the unlimited energy source like wind energy thus save running cost exhaust fans, wiring and also requires less maintenance. Above all, our range is economical, ecological and weather & storm proof. 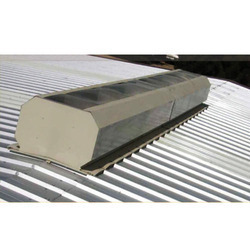 Roof Top Air Ventilator offered by us are precisely designed and engineered that enables them to exhaust Industrial pollutants such as smoke, dust, poisonous gases, humidity, fumes, heat and many more invisible irritants from the covered area. Our top quality range provides safe, healthier and more controlled environment by removing the entrapped heat and industrial emission and provide energy free cooling and fresh air through out the year. Wind turbo ventilators do not require operating time as they continuously rotate with the wind. 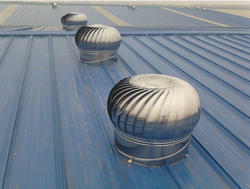 These products are Wind operated Ventilator that can be installed on any type of roofing and are rotated by the wind. As these systems function and perform with the unlimited energy source like wind energy thus save running cost exhaust fans, wiring and also requires less maintenance. Above all, our range is economical, ecological and weather & storm proof. 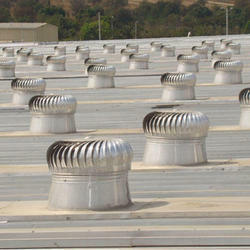 Roof Ventilators offered by us are precisely designed and engineered that enables them to exhaust Industrial pollutants such as smoke, dust, poisonous gases, humidity, fumes, heat and many more invisible irritants from the covered area. Our top quality range provides safe, healthier and more controlled environment by removing the entrapped heat and industrial emission and provide energy free cooling and fresh air through out the year. Wind turbo ventilators do not require operating time as they continuously rotate with the wind. 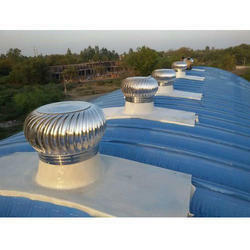 These products are Wind operated Ventilator that can be installed on any type of roofing and are rotated by the wind. As these systems function and perform with the unlimited energy source like wind energy thus save running cost exhaust fans, wiring and also requires less maintenance. Above all, our range is economical, ecological and weather & storm proof. 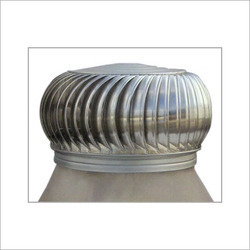 Stainless Steel Roof Ventilators offered by us are precisely designed and engineered that enables them to exhaust Industrial pollutants such as smoke, dust, poisonous gases, humidity, fumes, heat and many more invisible irritants from the covered area. Our top quality range provides safe, healthier and more controlled environment by removing the entrapped heat and industrial emission and provide energy free cooling and fresh air through out the year. Wind turbo ventilators do not require operating time as they continuously rotate with the wind. 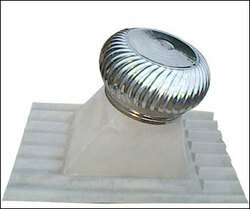 These products are Wind operated Ventilator that can be installed on any type of roofing and are rotated by the wind. As these systems function and perform with the unlimited energy source like wind energy thus save running cost exhaust fans, wiring and also requires less maintenance. Above all, our range is economical, ecological and weather & storm proof. We Stainless Steel Turbo ventilators offered by us are precisely designed and engineered that enables them to exhaust Industrial pollutants such as smoke, dust, poisonous gases, humidity, fumes, heat and many more invisible irritants from the covered area. Our top quality range provides safe, healthier and more controlled environment by removing the entrapped heat and industrial emission and provide energy free cooling and fresh air through out the year. Wind turbo ventilators do not require operating time as they continuously rotate with the wind. 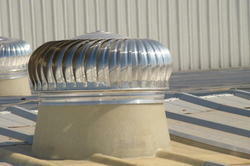 These products are Wind operated Ventilator that can be installed on any type of roofing and are rotated by the wind. As these systems function and perform with the unlimited energy source like wind energy thus save running cost exhaust fans, wiring and also requires less maintenance. Above all, our range is economical, ecological and weather & storm proof. The Turbo Roof ventilators offered by us are precisely designed and engineered that enables them to exhaust Industrial pollutants such as smoke, dust, poisonous gases, humidity, fumes, heat and many more invisible irritants from the covered area. Our top quality range provides safe, healthier and more controlled environment by removing the entrapped heat and industrial emission and provide energy free cooling and fresh air through out the year. Wind turbo ventilators do not require operating time as they continuously rotate with the wind. These products are Wind operated Ventilator that can be installed on any type of roofing and are rotated by the wind. As these systems function and perform with the unlimited energy source like wind energy thus save running cost exhaust fans, wiring and also requires less maintenance. Above all, our range is economical, ecological and weather & storm proof. The Turbo Air Ventilators offered by us are precisely designed and engineered that enables them to exhaust Industrial pollutants such as smoke, dust, poisonous gases, humidity, fumes, heat and many more invisible irritants from the covered area. Our top quality range provides safe, healthier and more controlled environment by removing the entrapped heat and industrial emission and provide energy free cooling and fresh air through out the year. Wind turbo ventilators do not require operating time as they continuously rotate with the wind. These products are Wind operated Ventilator that can be installed on any type of roofing and are rotated by the wind. As these systems function and perform with the unlimited energy source like wind energy thus save running cost exhaust fans, wiring and also requires less maintenance. Above all, our range is economical, ecological and weather & storm proof. 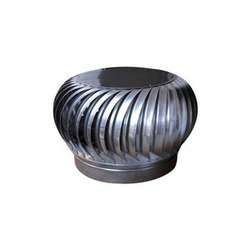 We are offering of Industrial Ventilators. 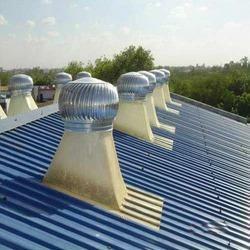 These products are Wind operated Ventilator that can be installed on any type of roofing and are rotated by the wind. As these systems function and perform with the unlimited energy source like wind energy thus save running cost exhaust fans, wiring and also requires less maintenance. Above all, our range is economical, ecological and weather & storm proof.